The best and brightest of the Home Technology and Integration industry journey to Las Vegas each January to search through the mass of people and products displayed at CES. Attracting more than 3000 exhibitors and 150,000 attendees from nearly every country, CES is the top Electronics show in the world. This years show took place as usual from January 7th – 10th in Las Vegas, Nevada. As well make sure to check out our special CES 2014 Newspage for Exhibitor news and announcements. The new 4-Port USB Charger offers a ground-breaking 4.2 Amps of charging power controlled by a microprocessor, providing the ability to charge up to four high-powered electronic devices simultaneously, including multiple tablets. The device is strategically designed with four generously spaced vertical USB Ports which provides additional room for maneuvering of charging cords and reduces stress on the cables while charging. There's no complicated network setup or pairing process. Just plug the 30-pin, Lightning™, or USB compatible Baton audio transmitter that is compatible with your iPhone®, iPad®, iPod® mobile electronic devices, PC, or Mac® computer and instantly play your favorite music, videos, and games using the apps you use everyday. If you want to connect your Korus speaker with a different source device just move the Baton. It's that simple. Audio over existing wireless technologies can lag and fall out of sync with on-screen video. That's not entertaining. The patented SKAA® technology built into each Korus speaker has an incredibly low latency so your sound stays dead-on in sync with your movies, videos, and games so you hear every word, note, and sound effects exactly when you're supposed to. Atlantic Technology has introduced a new version of its full-range H-PAS™ PowerBar home theater soundbar with a $100 lower price and the inclusion of an advanced Bluetooth adaptor. The new Atlantic Technology H-PAS™ PowerBar PB-235-BT is now shipping to its dealers with a new suggested retail price of $799. Each PB-235-BT includes one of the company's BTAA-50 Bluetooth adapters that features aptX processing for CD quality audio streaming, "tap and pair" with NFC equipped devices, and AACX decoding. The PB-235-BT soundbar is otherwise identical to its predecessor, and uses H-PAS™ technology to deliver exceptional audio performance on movies and music without the need for an external subwoofer. The bar can be mounted above or below a flat-screen TV either on a shelf or wall-mounting bracket. Boasting an 11 million pixel (5120 x 2160) screen resolution, the 105UB9 represents the successful collaboration between LG Electronics and LG Display. In order to realize the TV's curvature, new technology was introduced to resolve a number of issues, such as maintaining structural integrity and delivering uniform color and brightness across such a large screen. Until now, OLED panels were preferred for curved displays due to their ability to generate their own light. LG Display overcame the challenge of uneven backlighting by refining its Thin Film Transistor (TFT) pixel circuit technology to prevent color leakage and to ensure a superior viewing experience from virtually any angle. Dacor will introduce its new Discovery™ iQ 48" Dual-Fuel Range-the world's first range to feature a proprietary Discovery™ iQ Cooking Application accessed through an integrated Android™ interface. The Cooking Application eliminates the guesswork in preparing popular dishes and family recipes through a pre-programmed guide that enables users to prepare a wide range of dishes with the touch of a finger. Dacor will also demonstrate its Discovery iQ remote capabilities, which frees users to control their appliances from any room in the home or anywhere they have Wi-Fi connectivity. The remote application will be available for both Android and iOS™ devices. The expanded OpenHome Partner Program allows device partners to be easily and simultaneously certified compatible with iControl platform solutions, including those that power Comcast's Xfinity Home, Time Warner Cable's IntelligentHome and Rogers Smart Home Monitoring, among others. Certified devices will interoperate with the full spectrum of connected home solutions, from self-monitoring and home automation to professionally-monitored home security systems. The interoperability will initially be built on the open ZigBee standard and is designed to eventually support additional protocols and devices. YiFang Digital will introduce a BLE-controlled (Bluetooth low energy) smart lighting system at 2014 International CES. The system allows users to have complete control over their home lighting. It also allows them to program lighting to change throughout the day, creating a more balanced environment. By utilizing the free app for iOS or Android devices, users of the BLE-controlled smart lighting system can turn their lights on or off, modify the brightness or color, or choose from preset modes. The system supports iPhone 5S, 5C, 5, 4S, and Samsung Galaxy S4 smartphones. Its group control capability manages up to eight bulbs. The system is compatible with most sockets, such as E26 and E27. It has a working distance of approximately 30 feet. Constructed out of aircraft grade aluminum brackets, and with an aircraft grade steel safety cable, the TV mount weighs in at about a pound, a fraction of the typical TV mount weight. More shocking, as the registered trademark promises, the product's design is pure innovation. Requiring absolutely no anchors, it uses only tiny nails inserted into aircraft grade aluminum interlocking brackets. The new construction is so strong, it shocked the UL testers. It will hang any flat backed LED or LCD TV up to a UL rating of 80 pounds, screens sized 26" – 47". The nails leave nothing but pinholes in the wall, making it nearly invisible upon removal. 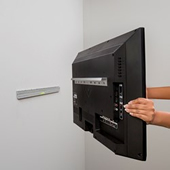 If that is not enough, the TV Mount is so simple to install, the entire project can be completed in about the time it takes to unpack the TV from its box. In a first for the home automation industry, Nexia has collaborated with Trane to produce the Trane XL824 Smart Control, the first thermostat to feature a built-in home automation gateway. Featuring the Nexia Home Bridge, the thermostat has the ability to communicate with 230 Z-Wave products throughout the home. The new touchscreen thermostat is designed to work on all standard HVAC systems and can alert homeowners if the system isn't working properly. As a result, consumers can rectify issues remotely, giving residents peace of mind and ultimate operational efficiency. The thermostat will be available in February through local Trane dealers. UEI QuickSet 2.4 follows up on the success of the original UEI platform that is currently deployed in over 70 million devices around the world including set-top boxes, connected TVs, media devices, game consoles, smartphones, and tablets. With millions of connected devices already deployed, UEI QuickSet 2.4 delivers the simplest and most intuitive universal remote control setup and control experience available today. This technology enables an AV device remote control to be set up and programmed to control virtually any television or entertainment device in the home, with minimal or no user input. With millions of new devices entering the digital living room, all vying to deliver entertainment content to consumers worldwide, the need for a universal control interface has become a priority for device manufacturers, content providers, and mobile platforms. 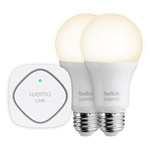 Belkin's new LED Lighting Starter Set and WeMo Smart LED Bulbs allow you to control, schedule and dim your smart LED bulbs from anywhere. As easy as replacing a standard light bulb, the WeMo Smart LED Bulbs work through the WeMo Link and are controlled via Wi-Fi and the WeMo app. The long-lasting bulbs are 60-watt equivalent with 800 Lumens and 3000 Kelvin for a bright, pleasing warm white light. Fully dimmable, WeMo Smart LED Bulbs can be controlled individually or in groups. The WeMo LED Starter Set includes two LED Smart Bulbs and a WeMo Link, which can support up to 50 individual Smart bulbs. Individual WeMo Smart LED bulbs also will be sold separately. 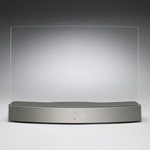 This revolutionary new speaker employs an ultra-thin, slightly curved, and optically clear acrylic glass transducer that allows it to disperse sound waves in multiple directions. Because of its innovative acoustic design, Clio can be placed anywhere and produce rich, clear, room-filling sound. Clio's sleek, minimalistic design allows the barely visible speaker to "disappear" against its surroundings. "We believe that good design, innovative engineering, and advanced acoustic technology are key to the enjoyment of audio in the home," said Stefan Bokamper, CEO, ClearView Audio. "Clio is our first product available to consumers and we are thrilled to enter the exciting space of wireless speakers. We are confident Clio will be hugely popular due to its impressive sound, stylistic fit with any interior design, and versatile Bluetooth® compatibility." The Goji Smart Lock is a state-of-the-art electronic deadbolt and the only smart lock with a built-in camera that sends picture alerts via push notifications to the homeowner's Goji App to show them who is activating their lock. With the Goji Smart Lock, Staples Connect customers will no longer need to carry traditional keys. Instead, they will be able to use their smartphone to lock or unlock their home or office and to grant and revoke day- and time-specific access privileges to others, all of which can be controlled through Staples Connect. The battery operated Goji Smart Lock works with Bluetooth Smart, WIFI and ZigBee. The latest launch from Bang & Olufsen is a radically simple approach to accessing the ever-expanding panoply of digital music possibilities, whether they're in the cloud, on your computer, NAS, mobile phone or tablet. Place a BeoSound Essence Remote wherever it's convenient, for example on the wall next to the light switch, and start listening to your favorite music when you walk into the room. Or put another one next to your toaster to add wake-up tunes to your morning menu. A simple touch is all it takes. Another touch lets you skip between playlist tracks or internet radio stations. You can also mute the music and adjust the volume – and that's it. Clearly visible and illuminated by LEDs under its transparent dome-shaped wave guide is a turbo-sculpted subwoofer enclosure. Six 1.5" mid/high-range drivers work together with the 4.5" subwoofer to deliver a full range of perfectly-blended, omni-directional sound. Harman Kardon custom DSP technology sculpts room-filling audio staging.